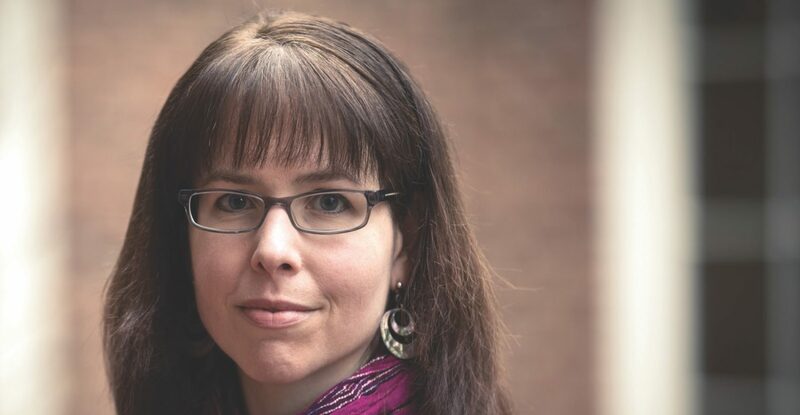 Molly Worthen, an assistant professor of history at the University of North Carolina at Chapel Hill, has focused her research on North American religious and intellectual history, particularly conservative Christianity in the 20th century. The author of Apostles of Reason: The Crisis of Authority in American Evangelicalism, Worthen gave the following talk from the main stage at the 2018 CCCU International Forum. It has been edited for length. I would like to start with a story that happened at L’Abri, the famous Christian commune in the Swiss Alps founded by Francis Schaeffer in the 1950s. I had the opportunity to visit there for a couple of weeks. One person made a real impression on me, and that was a girl named Amelia, the daughter of a PCA [Presbyterian Church in America] minister. She had just graduated from the University of Tennessee and told me that she considered herself “a poster child for the church” – that was her phrase. But she was increasingly uncomfortable attaching the label “evangelical” to herself, especially because she said it led people to assume they knew all about her politics when she wasn’t even really sure yet what her own politics were. Amelia told me that in her last couple of years of college she took a job at the local coffee shop, and she ended up making friends with all kinds of people who were not like her – non-Christians, gay students, pot smokers, the whole gamut. And this experience really got her questioning a Christian tradition that – at least as she had grown up understanding it – said that all of these people were going to some place not very nice at the end of it all. I think there are three things to note about this story. First, Amelia, like so many of the young evangelicals I’ve talked to is frustrated with what I’ll call “evangelicalism’s public political face,” her sense that outsiders automatically assume that all white evangelicals have the same politics. Second, she grew up learning a very rationalistic, head-focused approach to God that seems to have not quite equipped her for the problems she’s trying to sort out now – her relationship with non-Christians and her sense of purpose in a multicultural and kind of unpredictable world. And here’s the last point: My conversation with Amelia happened more than 10 years ago. I think this is important, because it seems like every week I read another article about how we are living through an unprecedented moment for traditional Christians in this country; a time of crisis unlike anything we’ve seen before; unprecedented numbers of young people leaving the church in droves; talking heads pronouncing the label “evangelicalism” just too corrupted, too politicized to be useful. And so often all of this is tied to the outcome of the last presidential election. Don’t get me wrong; the 2016 election was a moment of historical significance, absolutely. But I think that our current political situation has simply shed more light on long-standing debates and divides among evangelicals, and on a struggle of Christian educators to prepare students for modern challenges. That goes back at least a half-century. [In] my archive work at places like Biola and Wheaton, [I read] through the worried letters of educators from across the Christian tradition, about – this is in the 1940s and ’50s – how their students are just too focused on their salary and they don’t have a sense of ministry. My job as a historian is to tell you it has deep roots. We can recognize this broader context – and I guess it’s a matter of judgment whether the broad context is depressing or kind of heartening – while also taking stock of the way this generation of Christian students is absolutely different from the kinds of students who would have attended your schools in the ’40s and ’50s. I’ll sum it up this way: The thing students seek more than anything is not really a quest for the perfect watertight rational case for believing the Bible. Certainly, there are some students who are still very much preoccupied with these traditional questions of apologetics. But I think the thing they really crave – and it’s the same thing most of my students at [the University of North] Carolina crave – is a sense of authenticity. A sense of knowing who they truly are in the world, of being part of a human and humane community that is rooted in place and time and can occasionally persuade them to put down their smart phones and interact as real, living, breathing individuals. I want to tell you one thing that you as Christian educators can do for these students that I think very few people are in a position to do. And that is to give them a sense of their own history, of where they stand in the broad sweep of Christianity. I think the study of church history has a huge role to play in the future of Christian higher education. Occasionally, I have the opportunity to lecture on Christian campuses, and whenever I do, I always end up talking with faculty about their college’s particular history, its relationship with a particular denomination, with missionary organizations and how that history does and does not shape campus life. 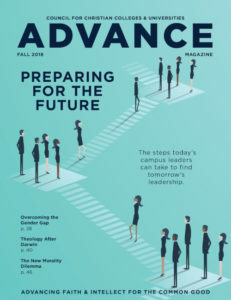 I’ve talked to Nazarene professors who are really proud of the way many churches in their denomination historically held mainstream fundamentalism at arm’s length and found ways to make room for a different relationship with science and to approach gender roles differently, in a way that they would call progressive within the bounds of orthodoxy. I’ve spoken to Anabaptists who want their students to understand the long Christian tradition of critiquing state power rather than necessarily seeking to accrue more power. I’ve spoken to Anglicans at Wheaton who are rethinking worship and who wouldn’t mind a whiff of incense in the Billy Graham Center now and then. My impression is that on many campuses, the quest for historical consciousness is experiencing a renaissance. There is a new generation of faculty and administrators who want to root themselves in the long sweep of Christian history and transmit a sense of that to their students. Students are hungry for it, especially the huge numbers who grew up in nondenominational or denominationally indifferent churches with a sort of implied myth that all there is to Christian history is: Chapter One, Jesus and the apostles; Chapter Two, the papist dark ages; Chapter Three, that Martin Luther guy; and then Chapter Four, the founding of their own church when Pastor Randy started holding Bible studies in his living room 20 years ago. Now those are great stories, but I think that learning their own longer, much more complicated history can give students the tools to see how varied and rich evangelicalism really is; to see these supposedly unprecedented challenges of post-Christian society in a richer context; and to see that, if they object to this or that particular evangelical self-appointed spokesperson, no single person can speak for the whole tradition – it’s far too messy. And they’ll see that if you grasp the breadth of evangelical history – if you even just get a taste of it – you quickly start to see that the labels “conservative” or “progressive” fall apart, and there are standards other than the political check boxes of 2018 for thinking about faith and evaluating faith’s relationship to a pluralistic culture. When I sat down to prepare these remarks, I got the idea to look up Amelia for the first time since I interviewed her many years ago. She’s married with kids, according to Facebook, and from what I can tell she has not left the church. She is pretty active in a Reformed evangelical congregation embedded in the University neighborhood in Knoxville – the sort of church that has been holding prayer services to protest white supremacy and very enthusiastically welcomes religious skeptics on its website in big letters. I immediately had the image of Amelia buttonholing some poor atheist who somehow ended up at coffee hour and finally having those passionate debates that she so craved at L’Abri. I think so many young evangelicals are a lot like her. They’re not looking for reasons to leave Christianity. In fact, they really want to stay. The trouble is that they have so often inherited a pinched, narrow understanding of what Christianity is. So, consider [having] a discussion about how to restore the broad, varied history of what it means to be Christian in the 21st century.